Profit bookings coupled with caution over the upcoming quarterly results subdued investor sentiments and led a barometer index of Indian equities to trade flat during the mid-afternoon session on Tuesday. Furthermore, both bellweather indices of the Indian equities markets which had previously gained nearly 2.12 percent on Monday, receded after a key data showed a fall in services output for the last month. Rupee too gave up its early gains after opening and depreciated marginally at 65.33 to a US dollar (1.00 p.m.) from its previous close of 65.28 against the greenback. It touched a day's high of 65.11. 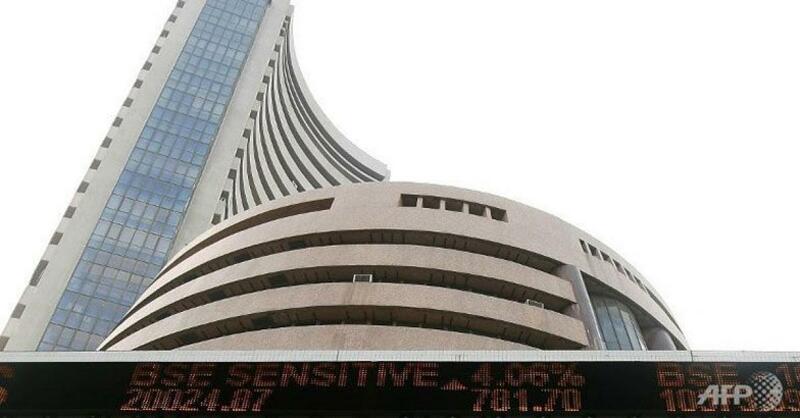 The barometer 30-scrip sensitive index (S&P Sensex) of the Bombay Stock Exchange on Monday closed with gains of 564.60 points or 2.15 percent. Similarly, the wider 50-scrip Nifty of the National Stock Exchange (NSE) closed 168.40 points or 2.12 percent higher. On Tuesday, however, the NSE CNX Nifty was trading marginally in the red. It was slightly down by 11 points or 0.14 percent higher at 8,108.30 points. The S&P BSE Sensex which opened at 26,976.66 points, was trading at 26,797.08 points (1.30 p.m.) -- 11.53 points or 0.04 percent up from its previous close at 26,785.55 points. The Sensex touched a high of 27,010.27 points and a low of 26,751.25 points in the intra-day trade so far. Market observers cited profit bookings and caution before the earnings season as the main reasons behind the flat trajectory of both the bellweather indices. "Profit bookings after yesterday's rally was witnessed. Selling at higher levels receded the markets. Caution also prevailed before the earnings season for major companies start. The investors are weighing in the sustanability of the rally," Anand James, co-head, technical research desk with Geojit BNP Paribas Financial Services, told IANS. Nitasha Shankar, vice president, research with YES Securities, told IANS: "Indian markets have entered into a consolidation mode after giving up their early morning gains." "Banking and tech stocks are dragging the index lower while pharma stocks are providing support. Small and mid cap indices continue to outperform the headline index," Shankar said. Sector-wise, consumer durables, healthcare, oil and gas, fast moving consumer goods (FMCG), and metal stocks witnessed healthy buying. However, information technology (IT), banking, and technology, entertainment and media (Teck) stocks came under intense selling pressure. The S&P BSE consumer durables index zoomed by 495.46 points, healthcare index augmented by 190.17 points, oil and gas index gained by 133.64 points, FMCG index rose by 80.40 points and metal index was higher by 69.54 points. The S&P BSE IT index receded by 155 points, banking index declined by 122.10 points and Teck index was lower by 59.68 points.